The Epic Giveaway keeps on giving. On Day 16, we have two fantastic Cooler Master peripheral bundles. Our grand prize is a MasterKeys MK750 keyboard, CM310 mouse, MP860 mousepad and MH751 headset. 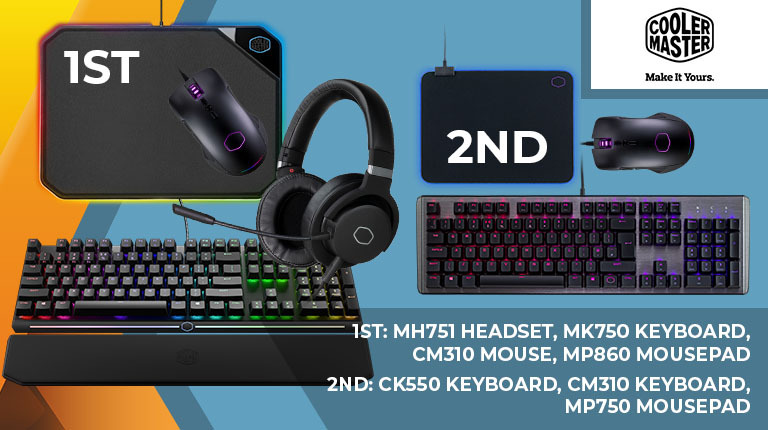 That's not all, as one lucky runner-up will bag a CK550 keyboard, CM310 mouse and MP750 mousepad! The competition winner will be picked at random from all eligible entries that arrive by 09:00 London time on the closing date, January 1, 2019. First prize is a MasterKeys MK750 keyboard, CM310 mouse, MP860 mousepad and MH751 headset. Second prize is a CK550 keyboard, CM310 mouse and MP750 mousepad. Nice! Thank you HeXus & Cooler Master! Happy holidays! Ah now, is this a trick question??? Yeah, but that's a Mac. Only purchases of an Apple PC would put up with getting their palm licked when they were trying to game. That looks so familiar :-) Though I don't have a fruit company product.